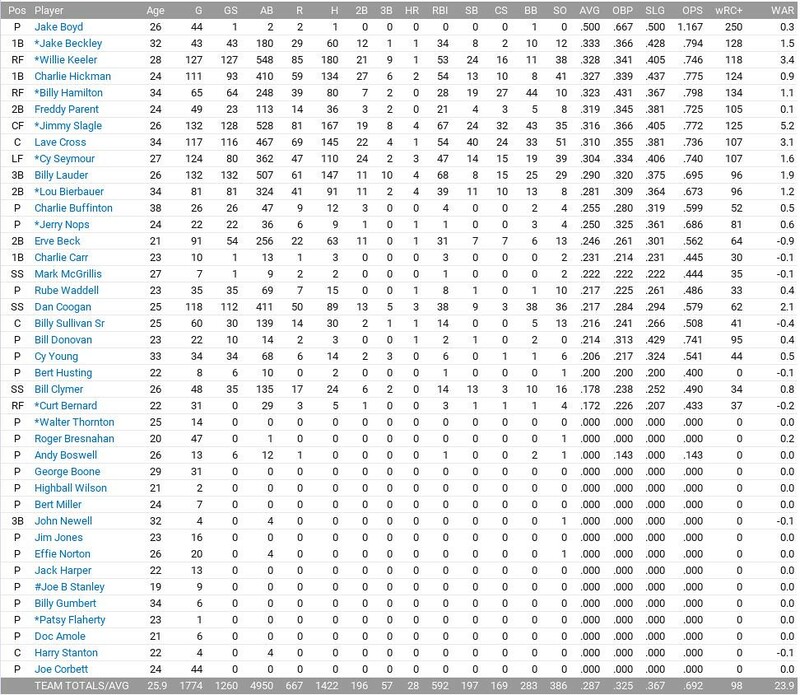 With Billy Hamilton spending most of the month on the disabled list, Willier Keeler, Jimmy Slagle, and Jake Beckley all put up offensive numbers that made Brooklyn the second rated offensive team in the National League. They finished the month 15-13 which was good enough for third place, 1 ½ games behind the Phillies. Things started turning around in May. The team ERA was almost two full runs lower in May than it was in April. Jimmy Slagle was the team MVP up to this point in the season. He wasn’t even a projected starter at the beginning of the year, but his .346 batting average combined with stellar defense helped him to steal playing time from Cy Seymour. Brooklyn improved their record to 33-25 in May, helping them to pull within a half game of first place. Brooklyn caught fire in June and began to create some separation in the National League. With a 19-5 record on the month, they would go into July with an 8 ½ game lead over New York. 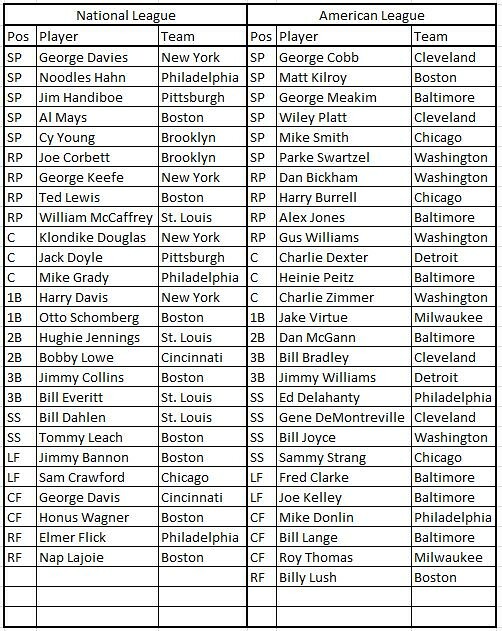 Interesting to note, in the 1900 All Star Game, six pitchers were featured who came up in the Brooklyn organization: Mike Smith, Alex Jones, Gus Williams, William McCaffrey, Joe Corbett, and Cy Yount. Only Corbett and Young were still with Brooklyn. A large number of injuries plagued Brooklyn in July. Charlie Buffington and Jerry Nops were both knocked out of the rotation. It was doubtful that either would be healthy enough to play before the end of the season. Jake Beckley and Billy Hamilton were both knocked out of the lineup. Neither would return in 1900. Brooklyn finished below .500 in July, but they took 2 of 3 from the Giants at the end of the month to maintain a 6 ½ game lead in the NL race. Brooklyn limped into August. They lost four of their first five and watched their lead drop to four games with a three game series against second place New York on the horizon. The Superbas got it together when they needed to, winning two of three against the Giants. Brooklyn played just as well down the stretch to fend off New York’s 8 game winning streak to end the season. Cy Young was named the National League Pitcher of the Month for August. The 1900 World Series featured Baltimore against Brooklyn. For Baltimore, it was their third World Series appearance, and they had one championship under their belt. For Brooklyn, it was their seventh World Series appearance including their second in a row. They had four championships in their history. 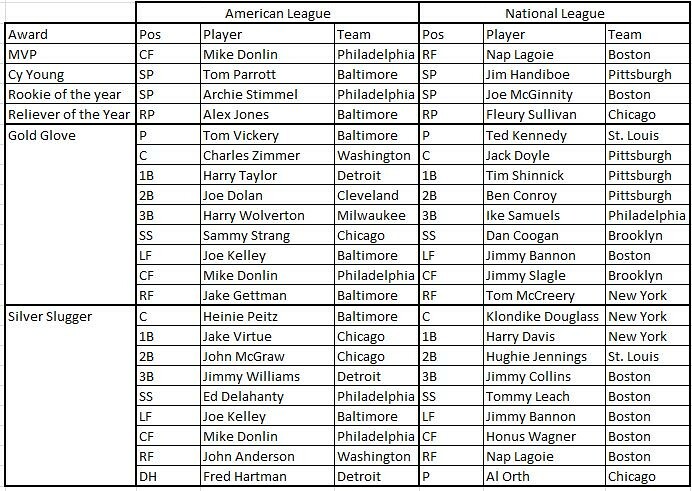 Baltimore’s offense, ranked number one in the American League, was led by American League batting champ Fred Clarke along with Bill Lange, Joe Kelley, and Heini Peitz. Their pitching staff was also ranked number two in the American League with a rotation anchored by Tom Parrot and George Meakim. Former Brooklyn player Alex Jones provided excellent support from the bullpen. For Brooklyn, even though Billy Hamilton and Jake Beckley would miss the World Series, an offense led by Jimmy Slagle, Willie Keeler, and Lave Cross still proided penty of punch. The concern for the Superbas is a pitching staff that would be missing Charlie Buffington and Jerry Nops. Rube Waddell and Cy Young provided a potent 1-2 punch, but Brooklyn really did not have a number three starter for this series. Cy Young faced George Meakim in game one. Brooklyn took a 2-1 lead in the 5th with a RBI fielder’s choice by Willie Keeler followed by an RBI-single by Lave Cross. Solo home runs by Jake Gettman and Joe Kelley put Baltimore back on top, though, and Brooklyn didn’t have a response, eventually losing 4-2. Henie Pietz went 4 for 4 while Tom Parrott scattered 7 hits over 9 for the shutout victory in game two. Lave Cross went 4 for 4 in a losing cause for the Superbas as Brooklyn lost 3-0 to fall being in the series two games to none. Bill Donovan got the start for Brooklyn in game three against Tom Vickery. Donovan got rocked, giving up six runs in 4 ½. Joe Kelley set the pace with a 3-run home run in the third, and Shad Barry went 4 for 5 with 3 runs scored. Baltimore took a 10-2 win and a 3-0 series lead. Cy Young got a rematch against George Meakim in game 4, but the Baltimore offense was just too much. Cy Seymour hit a home run for Brooklyn, but Heinie Peitz and Joe Kelley both had three hits en route to the Baltimore victory by a score of 6-1. That completed the series sweep of Baltimore over Brooklyn. Heinie Peitz hit .647 on the series with 6 runs scored to win the series MVP award.